Ferenc (Francis) II Rákóczi (b. March 27, 1676 d. April 8, 1735) was the leader of the Hungarian uprising against the Habsburgs. Considered a national hero in Hungary, he is an iconic figure in the formation of Hungarian national consciousness in context of the nation’s quest for independence from imperial hegemony. His Mansion and temple of the Maltese Cross is in Transylvania (now Romania), holding the enshrined records of past civilizations of glory and blue prints for a golden age to come. 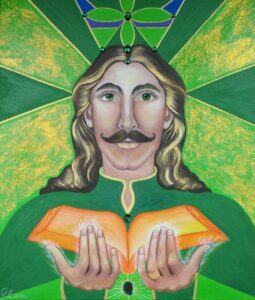 Master Rakoczi has now come forth as Cohan of the 11th Ray which has been bought back from the times of Atlantis, where he kept records of the divine light. As he was a great teacher of the light in Atlantis he manifested for the 13 Rays the gateways to the Akashic Records, stored for all souls reincarnated. In Atlantis he taught spiritual gifts of mysticism to link in to the Akashic Records on a higher and multi-dimensional vibration. Today by working with the Earth Star chakra he is opening your understanding of past lives. Maldovite is the crystal he is working with. The painting of Master Rakoczi holding the akashic records, focused on you to receive the information that is accurate. With integrity and honour of this knowledge, he asks ‘Are you ready’.